While Blackbox logs may be most well known for their tuning applications, they can also be used to diagnose many common problems that occur with our quadcopters. This is the reason we recommend that you always keep Blackbox enabled for your first few flights. In our last article, we put up a general guide documenting how to use Blackbox Explorer. In this article, we’ll dig deeper – looking at logs from quadcopters with serious problems and showing how Blackbox can tell you exactly what is going on. Symptoms: Quadcopter has bad vibrations or intermittent “jerks” where the motors briefly speed up. Analysis: Bad gyros generally show up in Blackbox traces as spurious spikes throughout the log. Think about what the above log indicates the gyro is telling the FC: every few seconds the quadcopter is suddenly rotating about the yaw axis for a couple of milliseconds and then abruptly stops. This type of behavior never happens in actuality, and is a sign of a failing gyro which is reporting bad data. In normal log traces during a hover or slow flight you should see no spikes. Fix: If you have a noisy gyro the only real option is to replace your flight controller. If it is a new flight controller, you should return it for replacement. Symptoms: Quadcopter behaves strangely at high throttle and idle. 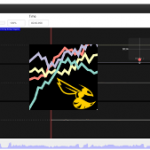 Analysis: Look at the motor graphs on the bottom of this Blackbox Explorer screenshot. Notice all of the motors except motor 1 are settled around ~33% power, while motor 1 is at 52% power. This continues throughout the log section we are looking at, even though the quadcopter is in a hover. In a hover, all motors should be at the same relative throttle. Fix: Check the ESC calibration on the offending ESC. If it is a BLHeli ESC, that means plugging it into your PC and checking it’s configuration. Make sure all ESCs have the same calibration. If they do, it is likely that the motor or ESC on the offending arm is defective. Symptoms: Motors slowly spin up to full throttle when armed on the ground. Quadcopter constantly drifts in flight. Analysis: Look at the RC Command graph. The rcCommand(yaw) field is constantly sitting overcenter, driving a constant yaw of 28 degrees/second. When you see a value overcenter that is straight like this, it’s a trim or gimbal issue. Fix: The quadcopter should be plugged into your computer so that you can go to the RX tab and check out the Receiver tab. If the values don’t center on 1500, you will need to use the trim or subtrim features on your radio to adjust it so that they do. If the values quickly oscillate around 1500, you will need to add deadband. 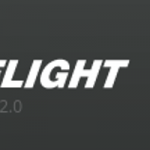 Check out our Betaflight configuration guide for more information on both of these topics. You don’t need to be a tuning master in order to find PID problems with your quadcopter. Excessive gains on any axis are relatively easy to see in Blackbox logs. 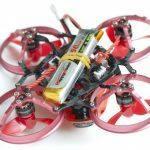 Symptoms: Quadcopter shakes several times after hard cornering or flips. Analysis: Look at the Gyro + PID roll graph in this screenshot. In it, the pilot is doing a barrel roll with the quadcopter. After stopping the roll, the quadcopter continues to oscillate before stabilizing. When you see big, regular, wavy motions like this after stick banging maneuvers, you know it is time to reduce your P gains on the offending axis. Fix: Reduce your P gains on the oscillating axis by a few points. We would recommend the above pilot start by reducing it by .5 on the roll axis. If you just have 2 or 3 oscillations, you might consider raising your D gain on that axis a few points instead. Symptoms: Quadcopter has high frequency oscillations after hard cornering or flips. Motors and ESCs are excessively hot after landing. Analysis: Look at the Gyro + PID roll graph in this screenshot. The P and D lines are rapidly oscillation back and forth – they are fighting each other. This results in the flight controller rapidly changing the throttle to the motors and causes a high frequency vibration in the gyro line. In general, you want your D lines to be less effective than your P lines – more like what is happening in the “Excessive P Gain” screenshot above. Fix: The easiest fix is to lower your D gains. If you are in this situation, though, you might be best off completely re-tuning your quadcopter from scratch with the default D values. Symptoms: High-frequency vibrations in flight. Fluttering props while idling on ground. Motors and ESCs hot after landing. Analysis: Notice the fuzzy ridges and peaks on the PID_D line in the chart above. You can see this oscillation is driving noise into the motor traces, which can cause oscillations in flight and will certainly cause your motors to run hotter than they have to. 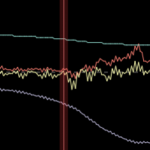 You never want to see very high-frequency, fuzzy looking lines like this in any of your graphs. If you do, you need to look into changing your LPF or Notch Filter options. Fix: Increase the dterm_lowpass filter setting in “Filters” on the “PID Tuning” tab by increments of 10 until the noise goes away.